Air Canada’s low-cost carrier Rouge is ratcheting up service to leisure destinations in Europe during the 2014 summer high season, which should prove a definitive test for the carrier’s theory that a low cost operation on routes producing softer yields is the correct equation to turn profits. The growth and operation of Air Canada Rouge to a possible fleet of 50 aircraft is a strategic pillar of the company’s efforts to cut its unit costs by 15% – quite a formidable goal. 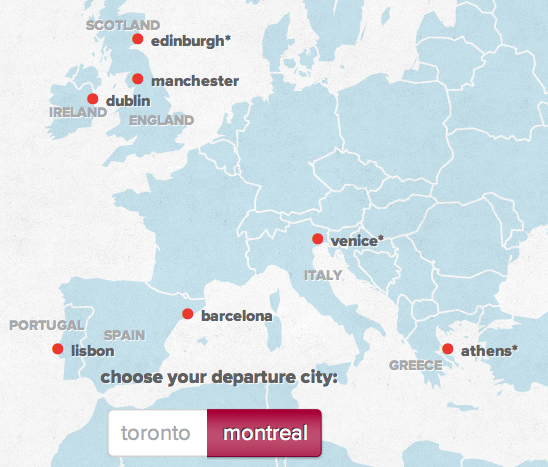 Similar to Rouge’s initial roll-out of service from Toronto to Athens, Edinburgh and Venice and from Montreal to Athens, most of Rouge’s planned route expansion during 2014 is into markets that have been served by Air Transat during the high season. With just a few months of operations under its belt, no clear-cut conclusions can be made about Rouge’s future or the total effects on Air Transat, but Air Canada appears to be throwing down the competitive gauntlet, noting that it is now in a much better position to compete on those routes. Rouge launched service in Jul-2013 with two Airbus A319 narrowbodies to serve transborder and Latin American and Caribbean destinations and two 264-seat Boeing 767-300ERs dedicated to serving the initial trans-Atlantic leisure destinations (listed above). All of those destinations will resume for the summer season in addition to new trans-Atlantic markets as Rouge’s widebody fleet expands. By the summer 2014 high season in the northern hemisphere Air Canada estimates Rouge’s widebody fleet will comprise eight 767-300ERs. Starting in May-2014 the widebody aircraft are slated to feature 282 seats in a three-class offering – premium Rouge, Rouge Plus and a regular economy configuration. Coinciding with the debut of the new widebody configuration is the launch of service from Toronto to Barcelona and Dublin, and from Montreal to Rome beginning in May-2014. The service to Dublin is planned for year-round, while flights to Barcelona and Rome will be seasonal. Following the launch of those flights service from Toronto to Lisbon and Manchester begins in Jun-2014 along with service from Montreal to Barcelona and Nice. Once the seasonal service from 2013 resumes and the new routes are deployed in 2014, the bulk of Rouge’s service will stem from Toronto Pearson, not surprising given it is Air Canada’s largest base. 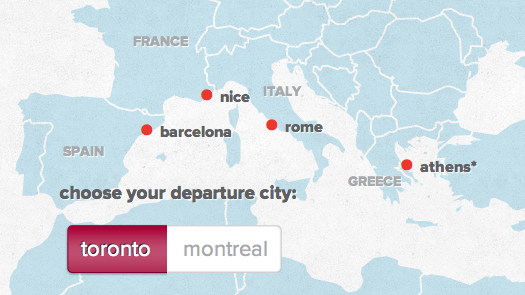 During 2014 Rouge will operate in four markets from Montreal – Athens, Barcelona, Nice and Rome. And during that same time Rouge plans to offer service in seven trans-Atlantic markets from Toronto – Athens, Barcelona, Dublin, Edinburgh, Lisbon, Manchester and Venice. 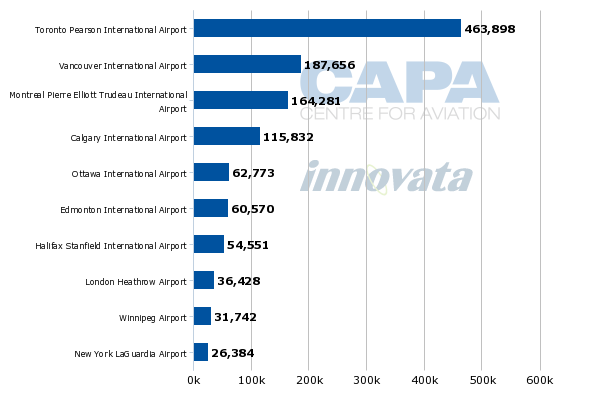 An examination of schedules in Innovata shows that Air Transat has served all of Rouge’s new destinations at some point on a seasonal basis with the exception of Edinburgh, and instead operates service to nearby Glasgow (75km from Edinburgh). While the tour operator will likely feel some pressure from Air Canada’s expansion into European leisure destinations, Air Transat’s parent Transat is executing a turnaround plan that produced solid top-line results for its 3QFY2013. After tax net income grew from CAD10.5 million (USD10 million) to CAD31 million (USD30 million) year-on-year while the company reversed a CAD44 million (USD43 million) loss year-on-year for the 9M ending 3QFY2013 to a profit of CAD8 million (USD8 million). The trans-Atlantic market accounts for a significant share of Transat’s business in the summer high season – roughly 65%. During 3QFY2013 its capacity in those markets was down 9%. At the time it reported earnings in Sep-2013, 81% of its capacity had been sold with loads falling about 1% year-on-year. However, the company noted selling prices (which include vacation packages) were 6% higher than in 2012. But revenues in the company’s European operations decreased 20% year-on-year during 3QFY2013 and 16% for the 9M ending 3QFY2013. The company cited its smaller footprint and the reallocation of some sales efforts from Europe to the Americas as the main drivers of the revenue decline. It is tough to predict Transat’s strategy and response to the new competitive environment it faces, but it looks as if Air Transat’s widebody fleet will remain steady at 21 aircraft year-over-year for the 2014 summer high season. Obviously, Air Transat and its parent company Transat are not resting on their laurels in the face of heightened competition with Air Canada. With the company’s turnaround plan bearing some fruit in the form of profitability for the first nine months of 2013, Transat should have a somewhat improved foundation from which it can compete with Air Canada. 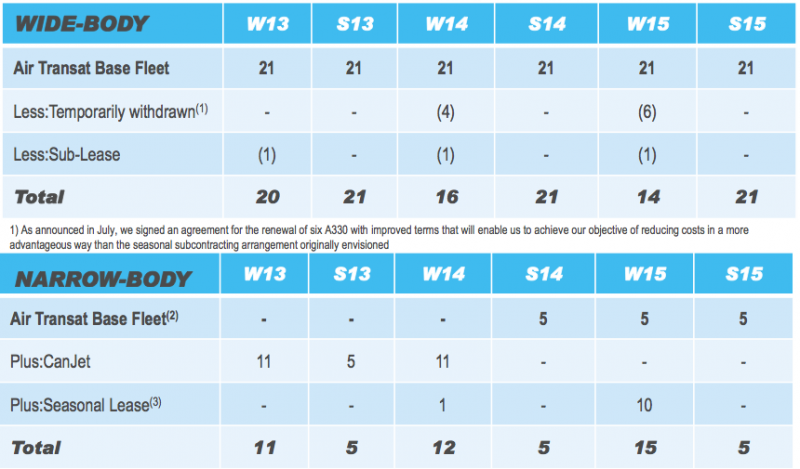 During 3QFY2013 Air Transat launched a new search engine for tour sales, and beginning 1Q2014 the company plans to introduce variable airfares on Air Transat. It has also launched an Option Plus package that includes seat selection, priority check-in, extra baggage allowance, priority baggage and excess luggage allowances, alcoholic beverages and meal services for a one-way or round-trip rate. Air Transat also has a more legroom option, which along with Option Plus is a similar product bundle offered by Air Canada and WestJet. Air Canada’s presumed improved competitive position is based on the carrier’s estimates that operating A319s and Boeing 767s under the Rouge cost structure should produce unit cost reductions of 21% and 29%, respectively, on those aircraft. After roughly four months of operations Rouge is still in its infancy, so virtually no assumptions can be made regarding its success or failure. But the carrier’s trans-Atlantic network development is clearly taking aim at Air Transat. Given Air Transat’s entrenched position in many of those markets, watching the competitive dynamics unfold should be interesting. Air Canada has set lofty goals for Rouge. Now it has to successfully execute its business plan, which is no easy task.